Vatvegan (adj.) - A term coined just days ago on Twitter by William Gibson, referring to a vegan who is nonetheless willing to consume artificially grown meat. Specifically, someone who has moral objections to eating conventional meat, but is willing to consume vat-grown pseudo-animal products so long as the substance consumed was not capable of experiencing pain. Artifical and/or moral meats have a long tradition in spec-fic, from the vat-meats mentioned offhand in Robert Heinlein's Door Into Summer to the sentient self-slaughtering cows found in Douglas Adams's The Restaurant at the End of the Universe to replicated meat found througthout the Star Trek mythos, vatvegans have been waiting for the goods for a long, long time. I bring it up because: Today is Thanksgiving in the United States, a day of feasting gleefully without much concern to potential (if overhyped) frankenfood farmageddon or the lessons of The Omnivore's Dilemma. 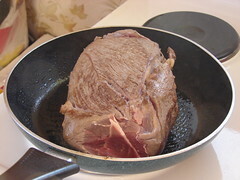 More specifically, Time named the nascent possibility of vat-grown meat one of the top technologies of 2009. Thus, we may be on the verge of sidestepping many of the moral concerns which have stirred many to vegetarianism (and into the ranks of PETA), leaving us only with the health risks associated with vat-meat. One wonders whether the next foodie counterculture movement won't be a rejection of "establishment" vat-meat in favor of natural farm-fresh animal flesh, with the next generation of suburban hippie defined as avowed carnivores, rather than prosetylizing meat-abstainers. Now that would be ironic.